It is time that someone with the State apply some subjective criteria and Common Sense to the situation at Old Pendergrass Road and the Damon Gause Bypass (U.S. 129) in Jefferson and Jackson County�.. Being an Attorney (Lawyer) and having been a long-time elected official (Politician), I have a wide tolerance for professions. I listen to the stereotypical jokes about lawyers, doctors, politicians etc with simple courtesy but take it with a “grain of salt”. That being said, I must admit to a stereotype among many government officials about engineers and “thinking like an engineer”. Frequently, they are involved with the math, charts and empirical evidence.In the real world, subjective criteria and common sense often demonstrate the fallibility of such empirical criteria. Most of us know of dangerous intersections. A big problem comes with Four-lane roads. Local traffic, which is the most frequent travel in an intersection, often must cross four lanes of traffic.In today’s world of big trucks, fast cars, cell phones, and much other, this is a dangerous mixture. Several times in recent years, we have observed numerous accidents, at least one fatality, near our home at the Intersection of U.S. Highway 441 (Oconee Veterans Parkway a/k/a Watkinsville By-Pass). The Intersection has a private school nearby on the local road and much residential development in the area. The Intersection does have a light.Oftentimes, a driver is charged or noted on reports as having “failed to grant right of way”. As a former State Farm Adjustor in my Pre-law life, I know that accidents are usually more complex than often seen on a superficial level. The local Oconee intersection seems more often to involve traffic Northbound on U.S. 441.One problem is the fact that this is the First Traffic light north of Madison, GA. Drivers are used to driving through country with minimal traffic-especially after the road becomes four lanes. Flashing lights and signs (Like on GA 316) would help. Most of us know the experiences of traveling in heavy traffic with large trucks in the mix. We also see the numerous telephones in use and the speed of vehicles.However, in an accident we tend to see everything as “Black and White”.That can cause erroneous assumptions. A Jefferson Intersection (Old Pendergrass Road and the Damon Gause Bypass) has been the site of numerous accidents and at least two fatalities in the last two years. Even though a New Krogers is coming online and several residential subdivisions are in the area, GA DOT recently declined to approve a traffic light. The Jackson Herald has taken many to task over the situation and rightfully so.SEE Excerpts Below. The GA DOT in its reasoning said the accidents were the result of Human Error and Speed! DUH! Could this not apply to all accidents?!?!. I have had occasion to study the “Fatality Crash” report on two fatalities at this intersection in February 2006. The skid marks and other factors demonstrate the problem of local traffic trying to get across four lanes of traffic with Large Trucks and heavy traffic involved. This Jefferson intersection needs some corrective attention. Local governments have some responsibility.The Jackson County Commissioners have offered to help Jefferson with half the cost of a light.However, since the four-lane is U S 129, a State Route, GA DOT and its engineers must approve it. To me, the intersection meets several of the “threshold” requirements used by GA DOT in a recent discussion of this issue at a Gainesville Intersection.SEE GAINESVILLE TIMES ARTICLE BELOW. 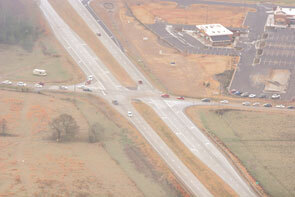 Recent Aerial Photo of Jefferson Intersection - Old Pendergrass Road and the Damon Gause Bypass. The Georgia Department of Transportation has turned down a bid by Jefferson officials to have a traffic signal put at the intersection of Old Pendergrass Road and the Damon Gause Bypass. The controversial intersection has been the scene of numerous accidents. Last year, two people were killed and 13 injured in 13 multi-car wrecks at the intersection. DOT officials said Jefferson leaders agreed to increase enforcement of speeding and failure to yield at the intersection and blamed most of the wrecks at the site on motorists themselves. “After examining crash reports most crashes were caused by speeding or failure to properly yield,” said the DOT news release. The report also urged motorists to slow down in the area. City manager John Ward, Mayor Jim Joiner and Rep. Tommy Benton met with DOT officials last Friday to discuss the matter. Crushed cars and bleeding bodies continue to pile up at the intersection of Old Pendergrass Road and the Damon Gause Bypass in Jefferson. Last week, three more people were injured in a bad wreck at what has become the most dangerous crossroads in Jackson County. Then again Tuesday, another wreck happened with one minor injury just as school let out for the day. • 26 total vehicles involved in multi-car wrecks at the intersection. And that’s just this year. A number of other wrecks have happened at this same intersection since the bypass opened in 2002. But despite ample evidence of a serious problem, nothing has been done to improve its public safety. Now there’s a “study” being batted back-and-forth between the City of Jefferson and the Georgia Department of Transportation. But that appears to be little more than bureaucratic dancing between two flat-footed agencies. And while bureaucrats shuffle papers, real people continue to have real wrecks and suffer real injuries and even death. There’s blame aplenty to go around in this public safety fiasco. The Georgia DOT should have anticipated that this intersection would be a major issue when it designed the bypass. With three schools less than one-half mile away on Old Pendergrass Rd. and the growth happening farther west along the road, the intersection should have been designed and engineered for a traffic signal from the beginning. The DOT did engineer signals a little farther down the bypass at the intersection of Hwy. 11 and in Arcade at the intersection of Old Hwy. 129. Obviously, someone gave thought to crossroad traffic before the bypass was built. Why they missed this important intersection isn’t clear. But it’s a state route and the DOT should make sure its roads are designed for safe public travel. While the state failed to plan appropriately, the City of Jefferson is even more liable for the problems in the intersection. It was the city that annexed land around the intersection and farther west on Old Pendergrass Rd. It was the city that issued building permits for five new subdivisions on the west side of the bypass and two on the east side along Old Pendergrass Rd. It was the city that issued permits for a massive commercial development at one corner of the intersection. It was the city that continued to expand its public school facilities, all of which feed off Old Pendergrass Rd. It was the city that bought land and built a large new recreation complex on Old Pendergrass Rd. just west of the bypass. And it was the city that did all that without one iota of planning for how traffic would be handled at this intersection. No foresight. Nada. Zip. Only after a public outcry earlier this year following a double-fatality wreck did the city get off its thumbs and officially ask the DOT for a traffic signal. But the town is broke and leaders appear to be frightened of the cost of upgrading the intersection. The city could have worked with the developers of those subdivisions and commercial projects to cost-share upgrading the intersection — but the town’s leaders were asleep at the wheel and missed that opportunity. Several weeks ago, the city sent its traffic study of the intersection to the DOT as the first step toward getting a traffic signal. Last week, the DOT kicked it back to the city’s consultants for more information. So the bureaucratic paper dance continues. How many more people will have to get hurt, or possibly die, before the DOT and city move forward on making this a safer intersection? Yes, it’s going to be expensive. Old Pendergrass Road will have to be widened on both sides to accommodate turning lanes. The traffic signal itself will have to be put into place. It won’t be cheap. The city will have to go further into debt to pay for it. But there is no alternative. A large Kroger grocery store is slated to open at the intersection in the coming months. School traffic continues to grow, including busses loaded with kids that daily traverse this dangerous intersection. New homes are being built and sold in the area. The new recreation complex pulls hundreds of people across that dangerous crossroads. Public safety should be the first order of business for any government, local or state. It is obvious that this intersection, as it was designed, is not safe. It is, in fact, a death trap. No more excuses. It’s time for both the DOT and City of Jefferson leaders to make it happen. It should be! THE priority for Jefferson officials and THE priority for the DOT in Northeast Georgia. Every additional injury and every death will be more blood on their hands if they don’t fast-track a resolution to this very serious problem. Not surprisingly, the Georgia Department of Transportation has decided not to put a traffic signal at the intersection of Damon Gause Bypass and Old Pendergrass Road in Jefferson. Despite the fact that this dangerous intersection saw 13 injury wrecks last year, the two roads don’t meet the DOT’s statistical criteria for a traffic signal. In other words, the DOT accepts no blame for a poorly designed intersection as contributing to the wrecks. Certainly, speed may have contributed to some of these wrecks. But it is insulting for DOT officials to sit in their ivory tower and declare their design is flawless and that only we stupid motorists are to blame for the multitude of wrecks at that intersection. • FACT: This intersection along the relatively new bypass has seen more wrecks than any other location. Is that because more dumb drivers traverse that intersection, or could it be because of the intersection’s poor design and the lack of a traffic control signal? • FACT: Other intersections along this bypass with fewer wrecks and less crossroad traffic have gotten traffic signals, although they certainly appear not to meet the DOT’s statistical criteria. Why is that? • FACT: The bypass on either side of this intersection is straight and slopes down hill, a factor that no doubt contributes to an increased speed in the area. While motorists should be mindful of speed, DOT officials shouldn’t be surprised that their own road design contributes to speed at this intersection. • FACT: Blaming motorists for a “failure to yield” at this intersection is laughable. Because of the design of this intersection, it’s almost impossible to know who has the right-of-way if you’re crossing on Old Pendergrass Road or turning off the bypass. It is a very, very confusing intersection with insufficient turning lanes and poor markings, all of which rests squarely on the shoulders of DOT engineers, not motorists. • FACT: The DOT upgrades intersections based on past traffic patterns, not future needs. But that criteria is crazy. It’s like building a new school based on last year’s students when you know you will need more classrooms next year. As it applies to this intersection, the new commercial development on one corner, the location of multiple school facilities along Old Pendergrass Road, the number of new subdivisions along that road and the new recreation complex are all increasing traffic to that intersection. To argue that such growth patterns can’t be considered in traffic planning is typical bureaucratic thinking and not based on reality. Despite what the DOT may argue, this is a very dangerous intersection, in large part because of how it was designed by DOT engineers. To deny that and to then turn around and blame motorists is both wrong and insulting. Is it going to take a fatal school bus crash before the Jefferson intersection at Old Pendergrass Road and the Damon Gause Bypass is fixed? Rumors hold that the Georgia DOT has been studying the dangerous intersection and that one state road worker was standing nearby when a wreck happened there last week. ‘Bout time. This shouldn’t be rocket science. Anyone with a map and aerial photos should have known this intersection was going to be a major interchange for the Jefferson area. It is where a North-South road meets a major East-West corridor. Both are growth areas. DOT engineers and planners should have seen that and planned accordingly with proper turning lanes and red lights. But Jefferson leaders have to share some of the fault as well. The town aggressively annexed land out Old Pendergrass Road and permitted a number of new subdivisions and homes. The town bought land and built a major recreation complex out Old Pendergrass Road. And the town has encouraged and issued permits for commercial development at the intersection. What Jefferson didn’t do, however, was plan for the proper road infrastructure to support all that development. It didn’t lobby the state DOT for a proper intersection with red lights until citizens began complaining. And although the city reportedly has plans to widen Old Pendergrass inside the bypass around the schools, it has no financial resources to actually accomplish such a feat. As a result of these governmental failures, everyone who passes that intersection is at risk, including the various school busses that serve all those new homes. When newcomers to Jackson County say they don’t want this area to become “another Gwinnett County,” this is what they’re talking about. They don’t want government to be obsessed with growth without actually planning for growth. They don’t want government to issue building permits for homes or businesses unless there are plans and resources to build the infrastructure to support those developments. This is also why, despite high taxes, residential growth will never pay for itself. The cost of providing public services to new homes is far more than those new homes generate in tax income. That’s why governments love industrial and commercial development. For the most part, both pay far more in taxes than they consume in public services. For some areas of Jackson County, it’s almost too late. The Braselton area is getting slammed with traffic as people try to make their way to I-85 each morning. The state is far behind in building for that on its major roads, which cover the West Jackson area. Jefferson is also behind in getting its transportation systems in order. The large growth of new homes east of Jefferson has caused the downtown area to become a narrow traffic funnel. Dreams of an East-West bypass are about dead due to the lack of city financial planning and the increased density of housing. In short, Jackson County has been successful in luring new residents, but its governments have failed to build roads for the increased traffic created by this growth. This is why people become cynical about government: Government grows at a faster pace than the economy, yet its services to taxpayers lags. Honk, if you’re mad. It won’t get you where you’re going any quicker, but it sure feels good to the soul. What does it take to get a STOPLIGHT? Gloria Wilmont has a question for traffic planners: What does it take to get a stoplight? She also is worried she knows, particularly where Gaines Mill Road and the Lenox Park housing complex access Athens Highway. "It's going to take someone getting killed ... before they do something," said Wilmont, 45, who lives on Gaines Mill. The perception that new red lights only come after fatal wrecks at intersections is common statewide. It also is wrong, Georgia Department of Transportation officials maintain. "'Breaks my heart," DOT spokeswoman Teri Pope said. "That is not the case at all. And sadly, most of the fatalities that happen, a signal would not have helped." That is because speed is the leading cause of wrecks that kill. But Pope and state traffic engineer Keith Golden also explain that deciding where signals go follows federal guidelines that factor in vehicle volumes, pedestrians, crash totals and types and other factors. "Just because you had a fatal accident doesn't mean it was correctable with a traffic signal," Golden said. The public's cry for signals is strongest in high-growth areas like Hall County, where rising traffic swamps intersections and sometimes turns risky driving into headline-grabbing wrecks. Gaines Mill, just southeast of Gainesville, is an example, a twisting two-lane road targeted for new subdivisions and connected to fast Athens Highway (U.S. 129). Wilmont's concerns were seconded by others attending a meeting Thursday about a 100-lot subdivision planned beside Lenox Park. The mix of workforce housing and apartments already channels hundreds of cars onto Athens Highway each day. But the DOT's template for studying signals, or any other traffic control device, doesn't change. It is the Federal Highway Administration's Manual on Uniform Traffic Control Devices, MUTCD to transportation insiders. The guidelines, adopted by states and followed by local governments such as Gainesville, include a checklist of eight standards to help determine whether an intersection warrants a signal. Those standards, called warrants, vary from vehicle numbers checked against thresholds for eight-, four- or even one-hour periods, to questions about crashes, pedestrian crossings and even how a signal fits into a system linking other lights. Golden said the first, vehicle volumes in any eight-hour stretch out of 24 hours, is one of the most crucial. "Typically, if you meet the first one, you're usually going to meet some of the other warrants." Meeting one or more suggests a signal is needed, not required. The manual and traffic officials stress that an engineering study of related factors is required. Another caveat is the research must show that installing a signal will improve safety and operation of the intersection. As Pope pointed out, the number of rear-end crashes often rises when red lights are added. The so-called crash experience warrant does not probe whether wrecks cause serious injuries or deaths. Instead, only crashes that could have been "corrected" by a traffic light during a 12-month period are considered. Also key: Have alternative options, such as trimming the speed limit and stepping up enforcement, already failed? The severity of accidents is cause for studying a site, as the manual says. But the tragic impacts more often plug into the engineering study that accompanies a warrants check, said John Karnowski, director of traffic and transportation at Street Smarts, a Duluth firm. Street Smarts did about 30 signal warrant studies last year, and has done some in Hall. The company even developed an introductory presentation called "So you want a traffic signal?" Anyone from residents to city councils can ask for a study. Local governments often require them for developers proposing large projects. The work requires counting vehicles, charting traffic patterns, sifting three years of accident data, and fitting all into a matrix of charts and graphs to gauge whether complex conditions are met. A study can cost $,000 to $,000. A signal can run $5,000 to $0,000 just for the equipment. There are other costs. They can include the high price of revamping an intersection, such as Gainesville did in realigning Maple and Oak streets on West Academy Street, near the Hall County Library. The intersection met signal warrants before, city traffic engineer Dee Taylor said. "But the signal operation would have been complicated exponentially if we didn't align Oak and Maple streets." Still, signal studies often spur disagreement. The developer behind the subdivision near Lenox Park prompted soft groans when he told the group at Rucker Memorial Baptist Church Thursday night that his traffic study revealed no need for a stop light. Others probably question the DOT's finding that the Jefferson bypass intersection at Old Pendergrass Road does not meet standards, either. Jefferson leaders asked for the light. 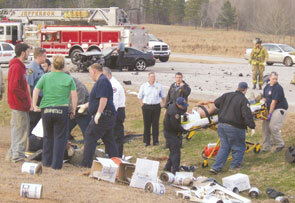 A newspaper reported two killed and 13 hurt in more than 10 wrecks at the intersection last year. Instead, with speed and drivers failing to yield cited as causes for most of the accidents, the DOT said it will install flashing beacons on the bypass (U.S. 129) and rework the crossing, while the city beef ups enforcement. Wilmont wonders when traffic counts are taken, reasoning that timing can sway results. Pope said the DOT, which governs red lights on state routes, does take a close look at data from engineering firms. The job: Making sure data is unbiased, she said. But traffic engineers on all fronts agree that signals are not a universal cure-all, whether for the homeowner navigating rush hour or the commercial developer trying to steer drivers into his shopping center. "Signals don't fix everything," Pope said. "Most crashes are caused by driver error. Just because a signal goes in does not mean that will be a safer intersection." Georgia has about 8,000 traffic signals. Wilmont is convinced another is needed on Athens Highway somewhere between Lenox Park and Gaines Mill Road. "Somebody," she said, "needs to come up with something." 1. Eight-hour vehicular volume: Does the number of vehicles on the main and side streets in eight hours of an average day exceed at least one of three conditions? 2. Four-hour vehicular volume: Does the number of vehicles in four hours of an average day exceed thresholds? 3. Peak hour: Do conditions cause undue traffic delays on a minor-street approach for a minimum of one hour on an average weekday? 4. Pedestrian volume: Is traffic on a major street so heavy that pedestrians trying to cross face excessive delays? 5. School crossing: Does traffic flow significantly hinder children crossing the major street at a school? 6. Coordinated signal system: Is a signal needed to help manage traffic flow on streets where lights systems are coordinated? 7. Crash experience: Has the frequency of crashes susceptible to correction by a signal exceeded five within 12 months, have volume thresholds been met and have alternatives to reduce accident frequencies failed? 8. Roadway network: Is a signal justified to encourage concentration and organization of traffic flow on a road network? *Standards are from the federal Manual on Uniform Traffic Control Devices. There are multiple, complex conditions for each warrant. Meeting one or more warrants does not require adding a signal.